About 70 percent of Jordan has an annual rainfall of less than 100mm. However, the population and water demand have increased during recent years and the groundwater resources are in danger of drying out. As the population continues to grow, it is necessary to find new resources to meet the future demands for water, for municipal, industrial and irrigation purposes. On behalf of the Ministry of Water and Irrigation, Sweco has implemented two projects, the As- Samra Wastewater Treatment Project and and the Disi Water Conveyance Project. Water is transferred from the Disi aquifer in the southern part of the country 325 kilometres north to the Greater Amman Area for use by the population. 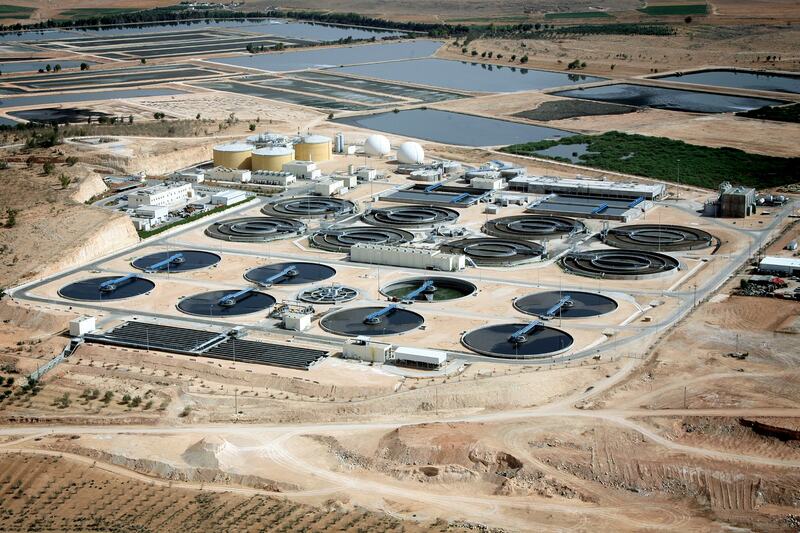 The resulting wastewater is treated at the As-Samra Wastewater Treatment Plant and then used for irrigation purposes in the Jordan Valley. The new As-Samra Wastewater Treatment Plant (WWTP) replaced an existing overloaded and inadequate waste stabilisation pond treatment system. The plant provides proper wastewater treatment for virtually all the wastewater generated in the Greater Amman area, and handles an average flow of 267,000 cubic metres/day. The effluent from the new plant, which is discharged in the King Talal Reservoir, meets Jordanian standards for discharge into streams and wadis and allows the safe reuse of treated water for irrigation. The As-Samra WWTP was a BOT (Build Operate Transfer) project and the concessionary built and will operate the plant for a period of 25 years. More importantly, it eliminates more than 90 percent of the pollution using advanced solutions to treat both wastewater and biosolids, not forgetting the biogas production and power generating turbines installed up- & down-stream of the plant that ensure a self-sufficient energy system. The Disi Water Conveyance Project secures the water supply to the Greater Amman Area by conveying water from the southern part of Jordan. A reservoir in the Disi-Mudawara area collects water from 55 production wells, pumping water from a finite underground water source, an aquifer. The water is conveyed through a 325 kilometres steel pipe, with a diameter of 1.6 metres, to two reservoirs in Amman. An average of 100 million cubic metres is transported annually. The Disi Project is also a BOT project and will be transferred back to the Ministry after an operational period of 25 years. The BOT concept has made it possible for the Ministry to benefit from the private sector’s capacity to arrange the financing of substantial projects and its experience of operating complex water facilities. The Ministry’s experience has been such that it intends to use the concept for future large supply projects in the Kingdom. To meet this increased demand and since no more groundwater resources are available, the Ministry will build a desalination plant, and intends to construct a pipeline between the Red Sea and the Dead Sea using the BOT concept. Water from the Red Sea will be desalinated and the brine will be discharged into the Dead Sea. The desalinated water will initially be distributed to Aqaba and Israel and at a later stage in the Project, be transferred to Amman and other cities in Jordan. The discharge of the brine into the Dead Sea will safeguard the water level in the Dead Sea, which currently sinks approximately one metre annually.